Several days has passed, and I still haven't recovered from that high fever, though somewhat better. Normally, I would have difficulty thinking and moving about when I'm in this state, but since a powerful clone of me was (accidentally) created and my mind merged with it later on, it's easy to forget that I was even ill as my mind is now spread between the two bodies. In fact, even though it's done by myself, having my cloned body to feed the unwell me in bed feels strange since I am being fed and feeding someone at the same time. The worrying part is that this fever is so high (40.3℃ when I first found out) that it could be life-threatening enough to be sent to hospital, which I have been to for different reasons. Seems that I was too excited that my cloned body doesn’t need to be fed at all that I somewhat neglected my original one. The day of the festival is getting closer. 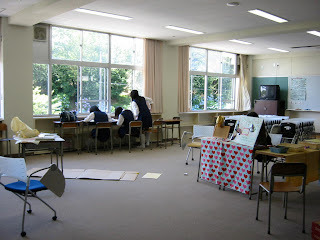 Most of the classrooms had the desk pushed aside, some of which are arranged in groups of 4 with a tablecloth and a small vase with a flower as they would be used as for some kind of cafe. I'm not really sure what my class will be doing as I was only asked to do some tasks. Fortunately, since falling ill, my tasks are less tiring and the workload reduced. Aiko and Haruna are some of the few that know my current situation very well. Aiko because she's the daughter of the director of the company I work for and drops by at work sometimes. Haruna because she is, in some ways, Except for homeroom period, classes are either temporally suspended, or are held elsewhere, to make space for the time to prepare. We still have to be at school during regular hours, though. School for the day has ended. Everyone seems to have disappeared shortly after the chime (キーンコーン). Some of the hard-working ones stayed behind, but there is still time. I had found out that the college department of the company I work for will also be involved, but not with the kind of things I would normally work with, like the device that caused me to be the way I am now, as those are possibly dangerous and confidential materials. Otherwise, it would have raised several unnecessary questions and problems that are otherwise avoided. Dropping by my former school, Tanigawa Kenjiro-kun was nowhere to be seen. I did however, saw a stage set up behind the hall with some people rehearsing and others watching. A girl that I know as Kotomi Miyazawa (宮沢ことみ), who is in the same year as me, approached me as she noticed me wandering around aimlessly in a uniform of a different school. I first met her back when I was a student here last year: I was walking past the door of her classroom when she suddenly bumped into me and the both of us fell down. The things she was carrying scattered all over and she landed in such a way that her chest was on top of me and her lips on mine. I couldn't help but feel that something at the upper part of her body was pressing against me. At the same time, my heart seems to beat faster than normal. We remained at the position when we fell, staring blankly at each other at a close range for what seemed like forever as we though what had just happened. It seems that she felt the same way as what I felt for her. What is this feeling I never felt before? Realizing that people were watching us, she suddenly shot up from me, gathered the books that scattered around us, and then ran away to the other side of the corridor as fast as she could, but not before I could ask for her name. She may not look like it, but she's quite good in maths, physics, and biology. I had a crush on her, but since I had changed, this feeling seems to have disappeared. In fact, my interest in girls has changed to that of guys. I don't know why that is so myself. Kotomi offered me to walk around and I agreed. The noticeable difference is that I don’t seem to think too much about the person I’m walking with, which is good as I’m more focused on the stalls than Tanigawa-kun. I can’t help but to focus on him back then, because my gender is now opposite of him and that I already know him well prior to the incident. 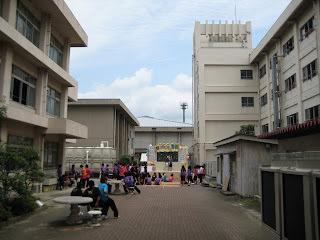 Besides that, the school looks more like a festival than it was when I last came here.